This is a great group of fish that no reef tank should be without. They do well in reef tanks and usually get along with most other fish. They can be somewhat aggressive, so you need to be careful with some of the group as they will become very territorial and chase and pick on other fish, and may attack shrimp and other invertebrates. They may fight with small wrasse or hogfish, like the six line wrasse as they’re similar in size and shape. They like to move things around the tank and some will pick up sand and drop it on rocks and corals. They need a good amount of rock work in a tank and you’ll see that a lot of them will hang upside down below rock faces. They are very hardy and will usually eat almost anything you feed them. They are usually very funny to watch, and they’re very active, and they never seem to lose the wild nature in them as a lot of other fish do once housed in a tank. They do jump from time to time, so you need to take that into account when keeping one. 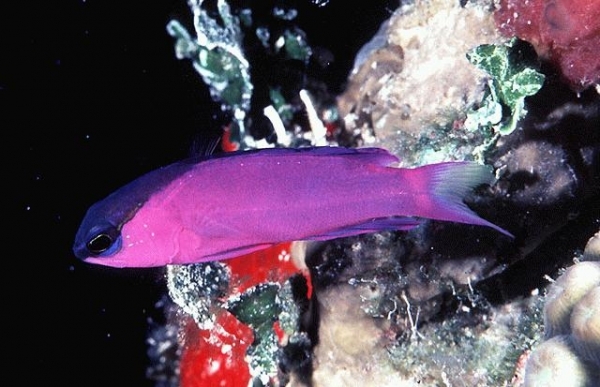 A dottyback that does very well in reef tanks and usually is not aggressive. It is very shy to the point where it will hide among the rocks. Can grow large, but even then its usually very peaceful. Should be kept in a minimum tank size of 55 gallons and supplied with plenty of rock work for it to hide. Rock faces need to be supplied in the tank as they like to hang upside down.